The Chinese New Year Parade on Feb. 2, 2014 in Chinatown. Windsor Terrace is hosting what's believed to be the neighborhood's first ever Chinese New Year celebration on Feb. 21, 2015. The Chinatown Community Young Lions will bless about 15 businesses. WINDSOR TERRACE — A Chinatown dance troupe that's performed at the White House and Carnegie Hall will help Windsor Terrace ring in the Chinese New Year this weekend. 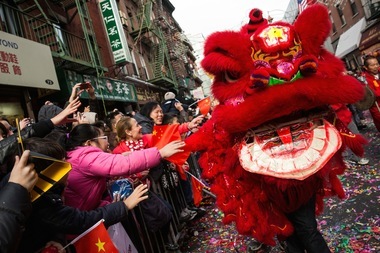 The Chinatown Community Young Lions will send dancers dressed as lions to bless about 15 neighborhood businesses starting around 4:30 p.m. on Saturday, Feb. 21. The celebration was organized by chef Chris Cheung, a member of the CCYL who is about to open a new dumpling shop in Windsor Terrace. Cheung wanted to have his fledgling eatery blessed and asked other businesses if they wanted to participate in the ritual. Cheung, who grew up in Chinatown but has lived in Windsor Terrace for 16 years, says he believes the celebration will be the neighborhood's first-ever Chinese New Year event. “I’m particularly proud of getting Windsor Terrace to celebrate Chinese New Year,” Cheung said. “I didn’t think the response would be all that great. I was hoping for three or four stores, but then all these stores said they wanted to do it. The whole neighborhood seems to be buzzing about it." Dancers will perform the traditional Chinese lion dance outside each business to chase away bad spirits from last year and welcome good spirits for the new year, Cheung said. At the end of the dance, the shopkeeper presents the lion with a red envelope containing an offering. The celebration marks the start of either the year of the sheep, ram or goat, depending on your interpretation of Mandarin. The mini parade will take place on the sidewalk along Prospect Park West, starting at Prospect Avenue and ending at Prospect Park Southwest. Participating businesses include Alison Animal Hospital, Lehman Locksmith, Najax Cleaners, the Double Windsor, The Sicilian, Terrace Books, Krupa Grocery and several others. The celebration will end at Cheung's East Wind Snack Shop at 471 16th St., which he's hoping to open during the week of Feb. 23. CCYL executive director Valerie Tom said locals are in for a treat. The 40-year-old group, based on Mott Street, has performed at Madison Square Garden and blessed entire shopping malls. But this will be their first trip to Windsor Terrace. "It will be something different," Tom said, joking that it could be a bit of "culture shock" for the area.